Our intermediate obedience class is a step above the rest. We use games and real world situations to build duration, distraction, and distance into the obedience skills taught in Doggy Manners. 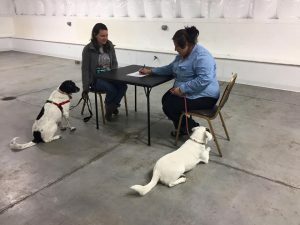 This unique class also helps handers and dogs develop the skills needed to pass the American Kennel Club’s Canine Good Citizen (AKC CGC) test. 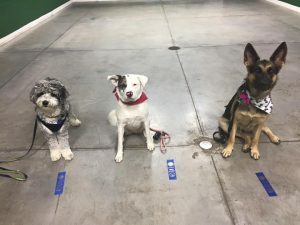 Regardless if you decide to test for the CGC at the end these skills give owners the power to feel comfortable bringing their dog into public places such as the vet office, cafes, and regular walks. 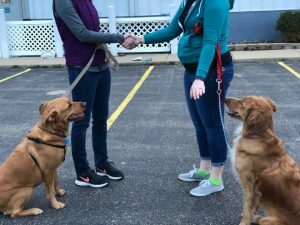 Dogs need to have completed our Doggy Manners class or get approval from our trainer, be up to date on vaccinations, and be dog and people friendly to participate in this class. 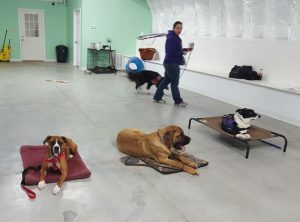 In addition to the regular CGC testing we also train prep and test for AKC Community Canine or CGCA (Advanced CGC) and CGC-Urban or CGCU in private training. Learn more about the CGC programs here. Class is 6 weeks long and cost of Class: $115. To see when our next Intermediate Obedience/CGC Prep class is starting please visit our group class schedule page. The AKC CGC is a great first step towards working to become a therapy dog team. For more info please contact us! Pictured are some of our CGC graduates, some have gone on to do therapy work.